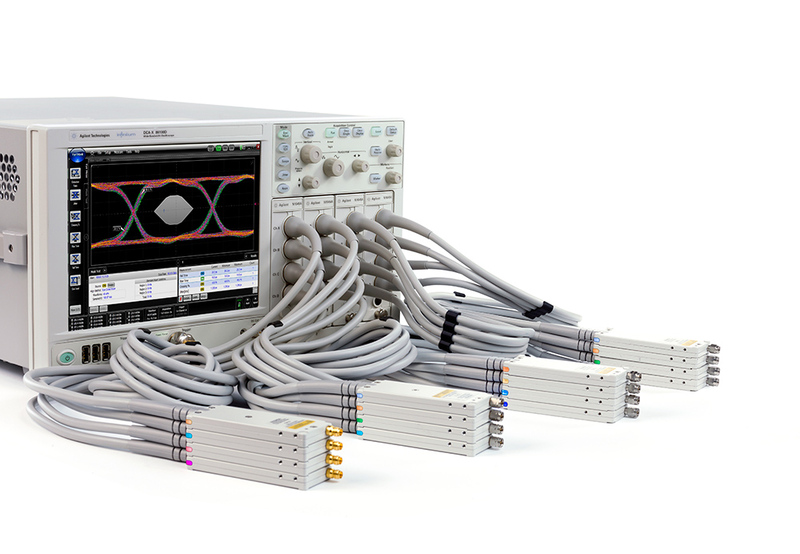 Agilent Technologies Inc. (NYSE: A) recently introduced a 60-GHz remote sampling head oscilloscope module for engineers who design, validate and manufacture high-speed electrical communications systems and components. The Agilent N1045A 2/4-port electrical remote sampling head module provides the most economical solution for accurately characterizing multilane designs used in today's new and emerging standards such as IEEE 802.3 ba/bj/bm (40Gb/100Gb Ethernet) and Optical Internetworking Forum CEI 3.0. Users can configure up to four N1045A modules in a single Agilent 86100D DCA-X wide-bandwidth oscilloscope mainframe to create a system with 16 channels. The popularity of smartphones, tablets and online video content continues to drive the need for faster network connections. Increased network performance is enabled through multiport serial interfaces operating at 28 Gb/s and up. Until now, testing high-speed, high-port-density components and systems required an expensive configuration of multiple oscilloscopes and complicated switching that compromised signal integrity. But the 86100D DCA-X mainframe, configured with one to four N1045A modules, provides a 2- to 16-electrical-channel measurement system that is both economical and accurate. By combining the N1045A with the 86107A precision timebase module, users can create an eight-channel 60-GHz system with an ultralow 200-fs rms timebase jitter. This is ideal for efficiently testing a quad differential port device operating at 25 to 28 Gbps. Each low-noise sampler is located at the end of a flexible 1.6-meter cable to minimize cable loss and ensure the highest signal fidelity. With a selection of bandwidth settings (60, 45, 35 or 20 GHz) and independent sampler skew control, the N1045A allows users to optimize the receiver for the device under test. The industry's lightest and smallest remote heads allow the samplers to be positioned in very tight locations. To minimize the use of adapters, the modules can be configured with 1.85-mm male or female connectors. "Today's engineers are tasked with creating devices that are twice as fast as previous designs and less expensive to build," said Jay Alexander, vice president and general manager of Agilent's Oscilloscope Products Division. "Test equipment that provides the necessary accuracy to validate next-generation designs while enabling lower costs is essential. The 86100D's channel density can increase throughput and lower capital costs, resulting in a dramatic reduction in the cost of testing while simultaneously improving measurement quality." Additional information about the Agilent N1045A can be found at www.agilent.com/find/N1045A. Product images are available at www.agilent.com/find/N1045A_images. Further information about the Agilent 86100D DCA-X wide-bandwidth oscilloscope family is available at www.agilent.com/find/dcax. The Agilent N1045A 60-GHz 2/4-port electrical remote sampling head module can be ordered now, with prices starting at $43,000.